Last issue we highlighted the significant impact fatigue can have on crews. In the case of the Pel-Air Westwind ditching, the aircraft captain, having obtained only 3–3½ hours of average quality sleep, displayed a fixation on a simple plan to land. He and the remainder of the crew were too impaired to recognise growing evidence that the plan was not working. The flight nurse and doctor received minimal to no sleep during the day of the accident as they were too busy caring for the patient. 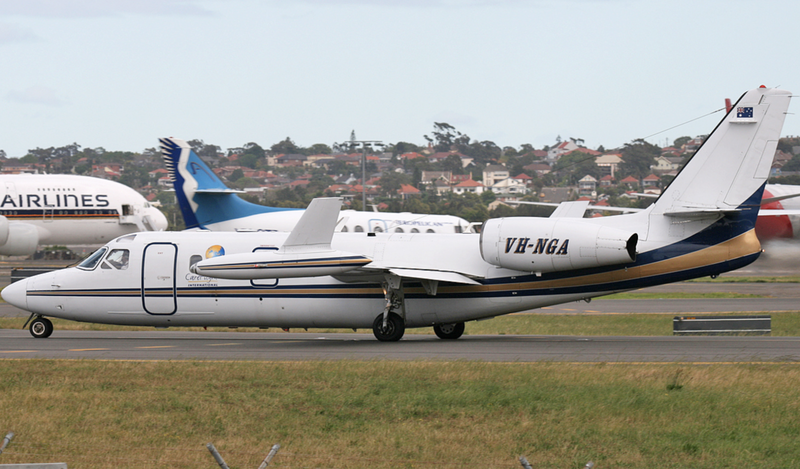 Even worse, the accident itself occurred on a remote island around 9.40pm, yet the crew were meant to be continuing from Norfolk Island to Sydney and then to Melbourne. This was well outside the acceptable limits of any mature fatigue risk management system (FRMS). This information has gained little attention even though it’s a clear example of failed company processes and regulatory oversight. The impact of elevated levels of fatigue is that people do not realise their level of impairment. They press on ‘lethargic and indifferent’ with a simple plan. This can occur in large organisations to even the most experienced crews. 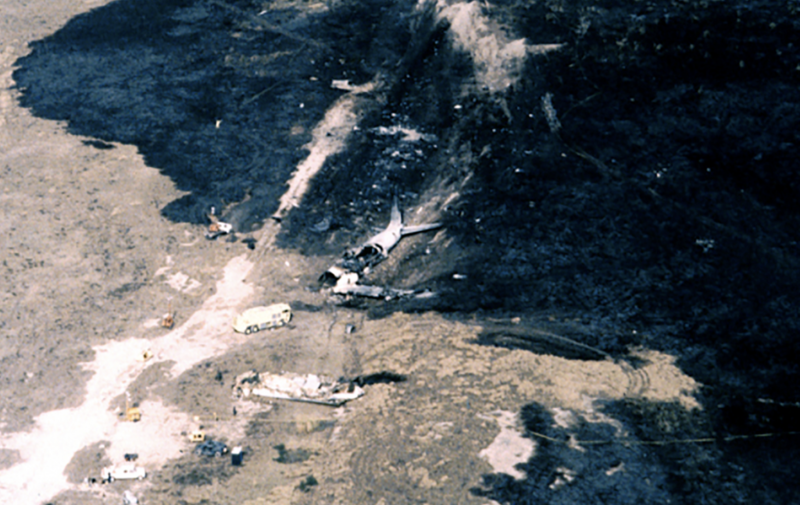 A clear wake-up call across international civil aviation was the 1993 crash of a DC-8-61 freighter while on approach to land at Guantanamo Bay, Cuba. It was one of the first accidents where fatigue was cited as the primary contributory factor. The US National Transportation Safety Board (NTSB) determined the probable causes of this accident were the impaired judgment, decision-making and flying abilities of the captain and flightcrew due to the effects of fatigue. Acute sleep loss contributed to degraded decision-making, visual and cognitive fixation, poor communication and slowed reaction times. Leading up to the accident, the three crew members had each been continuously awake for 23½ hours (aircraft captain), 19 hours (first officer), and 21 hours (flight engineer). The outcome being a loss of stabilised approach criteria and an uncontrolled in-flight collision with terrain. The aircraft captain who, like his copilot and flight engineer managed to survive this accident. They regained consciousness post-accident in “what felt like a crunched-up coke can, with wires and panels hanging all around them”. 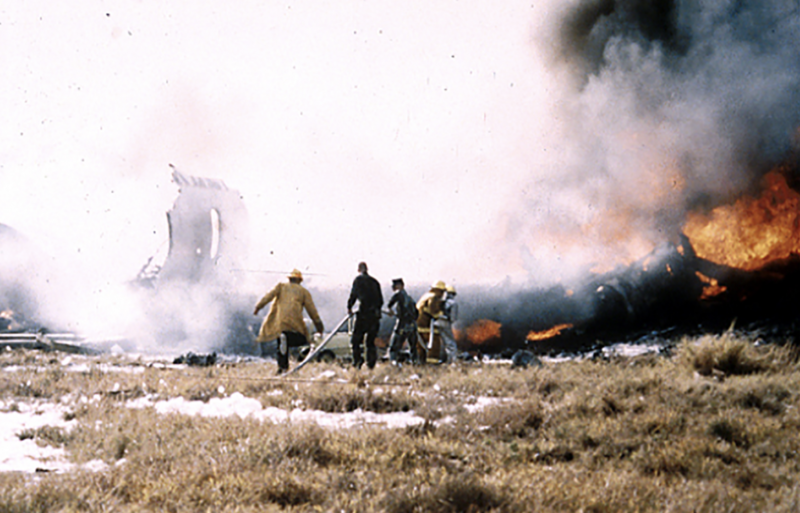 Luckily during the impact, the front part of the cockpit separated from the main fuselage and kept the crew away from the subsequent fireball that erupted as their four-engined jet transport crashed into the ground. Earlier that day the crew knew they were going to be exposed to elevated fatigue risks and had planned to make a more conservative approach, rather than an approach that required visual guidance from a ground-based strobe light (that on the day was not working). However, after receiving a request from air traffic control very late in the flight, when fatigue levels were excessive, they elected to change their original plan to a far more demanding visual approach that required steep manoeuvring to make the landing.This was all at the captain’s suggestion, “Just for the heck of it”. During the final minutes of the flight, the cockpit voice recorder (CVR) clearly highlights the negative effects of fatigue. These include cognitive fixation (too focused on identifying a strobe light to the detriment of other cues), and pattering checklists by rote but not having the cognitive ability to recognise and act on other critical information such as airspeed control or verbal cues that the aircraft was well outside safe parameters. FO: Right inside there, right inside there. FE: You know, we’re not gettin’ our airspeed back there. Capt: I still don’t see it. FE: [Expletive], we’re never goin’ to make this. Capt: Where do you see a strobe light? Capt: Gear, gear down, spoilers armed. FE: Gear down, three green, spoilers, flaps, checklist. ??? : There you go, right there, lookin’ good. FO: Do you think you’re gonna make this? Capt: Yeah… if I can catch the strobe light. FO: 500, you’re in good shape. FE: Watch the, keep your airspeed up. ??? : Don’t – stall warning. ??? : There it goes, there it goes! This crew were highly experienced (far more experienced than the Pel-Air crew), yet they too lost the ability to recognise what, in hindsight, look like obvious cues to us, that could have broken the error chain. The aircraft captain (Jim Chapo) had more than 20,000 hours flight time. He had served as a check pilot with a major commercial airline prior to commencing night cargo work. But, he received no specific training on the effects of fatigue, even though the night cargo work was quite different to the rosters he had experienced with the airline. As part of an NTSB fatigue factors training course I attended, I was fortunate to hear a presentation from Jim. He reported feeling “lethargic and indifferent” during the approach and, when he later reviewed the CVR, was surprised at how unresponsive he was to the concerns of others. It was an emotionally moving presentation to listen to Jim so openly and honestly recount the horror of surviving an accident and the long-term trauma that followed. At the time, the crew were operating in accordance with the regulations and company procedures. It further highlights the true dangers of elevated levels of fatigue and the severe impairment to decision-making and cognitive processing. Your challenge, in making sure you utilise human factors for high performance, particularly if you’ve made a transition from one type of operation to another – for example, ab-initio flying training to night freight operations – is to make sure you identify such gaps. True high performers don’t accept the status quo. They know their own limitations and they continue to respectfully seek the training and/or enhanced processes necessary to ensure they can maintain proficiency. One of the biggest challenges of fatigue is that certain conditions experienced by one person may have little to no impact on performance, yet another person under the same conditions can be severely impacted. I’ve been fortunate over the years to gain some detailed operational experience in managing fatigue, including the use of specialist sleep watches to obtain real sleep data. This has involved the development of fatigue risk profiles, not as an academic research project, but rather for the management of a known hazard (fatigue) with the constraints of a safety management system (SMS). So, look at the following real patterns of sleep, which are shared with consent. 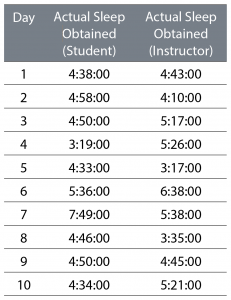 The first data column contains 10 consecutive days of sleep hours and minutes during a time when a student was completing a very demanding aviation training course on a high-performance aircraft. The second column contains 10 days of consecutive sleep data for the same person, though this time the person is performing an instructional role. What are your thoughts? Is this person fit for duty? I hope you want to ask some further questions. As background, this person does not have a short sleep gene – they’re not one of the less than three per cent of the population that can perform well with much less sleep than most of us. In fact, when on holidays and relaxing (a good way to identify your normal sleep patterns) this person records seven–eight hours of sleep per night. What’s your answer? Is this person fit for duty in any workplace, let alone within the cockpit of an aircraft? If you’re like most, including several sleep doctors, the answer is no. Yet this person performed to a high standard throughout the duration of a particular training course. The bigger challenges were the longer-term impacts to the individual’s health and wellbeing. I remember asking this person, when they were an instructor, their partner’s views on the impact to their sleep patterns. The response: “They just wanted their old partner back”. It was at this point they sought specialist help from a sleep clinic to re-correct their sleep patterns, including techniques to manage the anxiety that was leading to poor sleep. While this person might be praised for their ability to perform well under such trying conditions, you need to be careful to not consider this as acceptable. The reality is disrupted sleep patterns like this over the longer-term lead to poor health outcomes. It’s also important to consider others that may not be able to perform like this, particularly if the additional stressors (such as a busy conversion course) are quite high and are actively contributing to additional anxiety and disrupted sleep. If, combined with a late night or very early morning simulator runs, you may be failing more than capable personnel at great cost. For most of us within our aviation organisations, life is pretty busy. We often seek simple solutions; it helps us tick off our task list and to move onto the next priority of the day. Only a fool dare tread in this space when dealing with human fatigue. For supervisors, you’re probably after a simple set of rules that not only define a broad limit for scheduling practices and fatigue management, but that can be used to make sure people conform to general work practices. For example, if most of the team can handle a night shift in accordance with the rules yet one team member (we’ll call him Chris) cannot, what assumptions do you make? Have you ever heard phrases such as, “Chris is lazy”, or “Chris just doesn’t cut it in this workplace”? Chris may be more than competent to perform most tasks required to a high standard, it’s just that Chris’s individual biological differences result in a small part of the workplace routine not meeting his needs. In mature organisations, these differences are understood and managed to align workplace practices to better support individual needs and to better understand the true complexity of fatigue. Yet so many organisations prefer the overly simplistic approach and along the way they lose good people like Chris, or even worse, they create a ‘them and us’ culture between workers and supervisors/managers. The outcome is often catastrophic. After an accident, workers may state: “We knew that was going to happen, fatigue has been a problem for some time, why wouldn’t our managers listen to our concerns?”. In turn the managers respond: “We’ve got a fatigue risk management system and there’s nothing in there that suggests we had any problems”. Simple tools applied to complex problems tend to erode confidence and trust in the fatigue management system and can decrease the open and honest exchange of information regarding the real problems. The US Federal Railroad Administration (FRA 2010) compared a local Australian fatigue modelling tool with another BMMF model, the Fatigue Avoidance Scheduling Tool (FAST), which the FRA had previously validated for use in the rail industry. Based on this comparison, it concluded the local fatigue model scores between 70 and 80 can be associated with ‘extreme fatigue’. If there has been very little duty time in the previous seven days, the local fatigue model will underestimate the potential fatigue level associated with the next duty period, and at times this level of underestimation can be significant. Yet many local operators continue to utilise scores between 70–80 under the watchful eye of the regulator. If you’re experiencing this type of FRMS then stand up as a human factors practitioner of high performance. Make sure you utilise any reporting mechanisms available to ensure you don’t experience the same outcomes as the crew of the Pel-Air aircraft. As humans we’re complex systems with our own unique biological needs. The combination of disrupted sleep, anxiety and/or fatigue (physiological degradation) remains one of the most significant contributors of degraded performance and increased errors, including eroded decision-making. A good starting point in any workplace is to better understand the multiple factors that can contribute to excessive fatigue. It is also critical in larger organisations to develop a high trust relationship where people are comfortable to report sleep and fatigue issues to ensure policy and process can be enhanced. If you’re a smaller operator then the best you can do is to educate yourself on relevant fatigue factors and to make changes to your own habit patterns for enhanced outcomes.